I am a people person at the end of the day, I like people and cultures, generally Rwandans and Ugandans have not been happy and fun people. I truly do not want to focus on this; however readers need to get a grip on what happened here. This violence appears to be over, these countries are very safe and easy to travel, as best I can tell the atrocities that happened in Uganda and Rwanda are over. 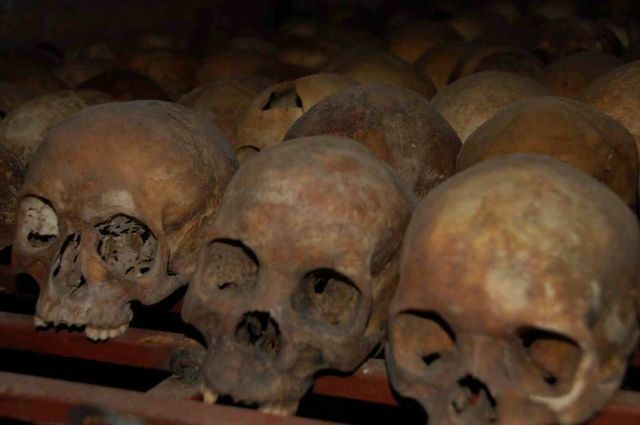 1994 there was Genocide in Rwanda between the Hutu and Tutsi where some 500,000 people were killed. Idi Amin terrorized the Uganda population from 1970 to 1979 killing mass amounts of people. I do not wish to focus on these issues; however it is simple to understand why these two countries are not happy. Just a year ago there were riots in Kenya where many people were killed, however Kenya is generally happy in comparison to Uganda or Rwanda and Ethiopia is paradise. … So much for my Mother and Father being blissfully ignorant about these two countries, however I am about to leave for Burundi where there are more fun and games. There is a sign announcing the genocide at every small village I pass, this appears to be the main tourist attraction of Rwanda. This for sure is not my type of tourism. I learned that at a mass grave in Iraq, I do not enjoy mass murder.